The saddle has landed!!! 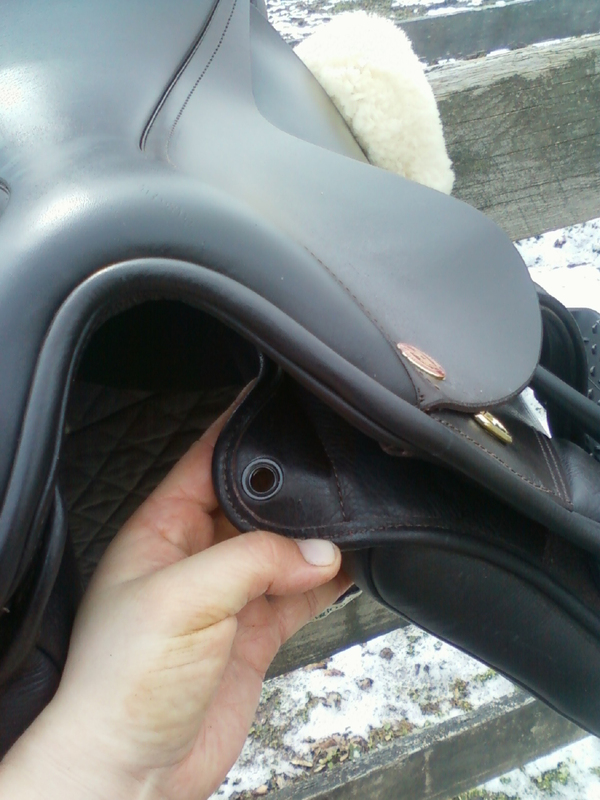 The saddle fitter delivered Wizard’s new saddle and customized it to fit him properly. She did wither tracings and compared them to his last tracings, which were done in October 2012. Although he dropped weight, he gained about 3/4 inch of topline muscle. It seems like our winter of rest, long line work, and hand walking has paid off! Interestingly, his back is more symmetrical as well. Now the trick is to keep it symmetrical as we ease back unto under-saddle work. The snow started to fall pretty heavily during our ride, but nothing was going to keep me from riding! Wizard stood quietly as I put my foot in the stirrup for the first time in five months, and other than some ear flattening and an opinionated kick or three, he was quite well behaved. Once he was a little warmed up, I got a nice soft trot out of him. He was better to the right than he was to the left. The ride was quick because I did not want to overdo it on the first day. We mostly walked and did a little trotting for about 20 minutes total. Ahhhhh, it feels good to be back in the saddle. 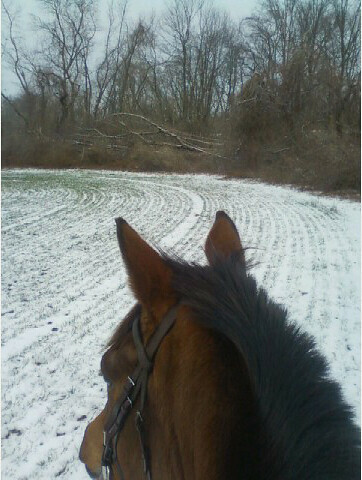 Sunday morning, I saddled Wizard up for a quick walk in the Assunpink. This marked our first solo trail ride at the new farm, and Wizard was up to the task. A local trail group had a hunter pace scheduled, so Wizard watched the horses unloading from the trailers in the parking area. We took the back field past the hunt club and looped around back to the barn. The piece of hardware that connects the flap to the gullet plate was missing. It must have fallen off during our ride. Now I have to find out if the saddler has an extra that she can send me and if there’s anything else that needs to be done to fix it.